Finland-based Emberion recently announced its plan to present new products for visible light to shortwave infrared (VIS-SWIR) detection at SPIE Photonics West in San Francisco 5-7.2.2019. The showcased linear array is said to have been specifically designed for spectroscopy and use graphene as a charge transducing layer. Emberion introduces a cost-competitive 512 × 1 pixel VIS-SWIR linear array sensor for visible to shortwave infrared spectral range. The sensor provides superior and consistent responsivity with very low noise over the broad (400 – 1800 nm) spectral range. 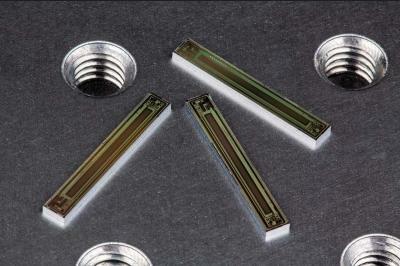 The sensor comprises an array of 25 × 500 µm2 pixels monolithically built on a tailor-made CMOS readout integrated circuit. The ROIC contains an analog front-end, performs analog-to-digital conversion and signal pre-processing, implements an electric shutter, and provides digital data output with up to 16 bits resolution. Emberion also offers measurement modules for technology evaluation and application development purposes. The module includes HW & SW implementation for the sensor readout, control and signal calibration, power management, and a USB interface. The sensor and the module are available commercially in July 2019. Beyond the linear array product introduced, Emberion will offer VGA imagers in late 2019. These VGA sensors cover the same VIS-SWIR spectral range (400-1800 nm wavelength) and are well suited for night and machine vision as well as hyperspectral imaging. These imagers will bring to the sensor market high performance VIS-SWIR wavelength detectors at an affordable cost compared to existing products, thus enabling wider adoption of VIS-SWIR imaging technologies in existing and emerging application areas. Additionally in late 2020, Emberion will offer a novel ultrasensitive uncooled bolometer array for thermal imaging. This thermal image sensors will have a very competitive thermal resolution/sensitivity performance in room temperature operation – comparable to current cooled detector performance.